33.0 mil (0.80 mm) specially compounded rubber backing with acrylic adhesive and a silicone easy release tan paper liner (reverse wound). 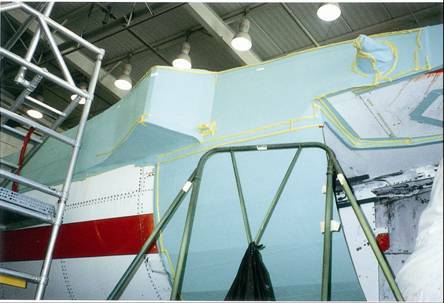 9 Rolls Per Case Protects aircraft skins during stripping plastic media blast paint removal operations. Used for removing paint on aircraft by impact stripping and sandblasting wood and glass signs.